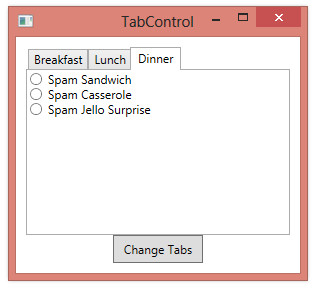 You can use the ItemContainerStyle of a TabControl to dictate the content that appears on the tabs, creating a style that sets each TabItem’s HeaderTemplate. As a slightly more straightforward way to do the same thing, you can just set the TabControl’s ItemTemplate property to a DataTemplate that defines the content for each tab. 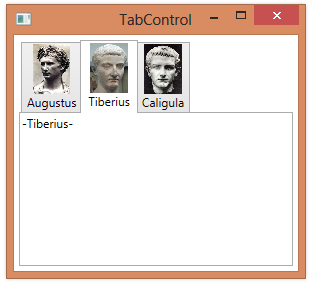 In addition to using data binding to control the tabs that appear in a TabControl, you can use binding to control which tab is currently selected. Below, we bind the SelectedIndex of a TabControl to a property in our class. We do the same for a ComboBox, as well as binding the ItemSource of the ComboBox to the same collection that the TabControl is bound to. After doing this, we can use the ComboBox to select the correct tab or manually select a different tab to cause the ComboBox to be updated. 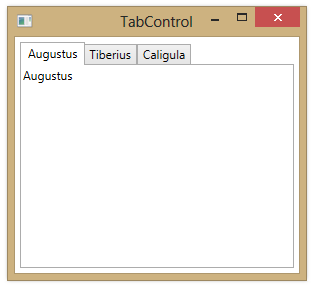 You can bind a TabControl to a list of objects, which causes a new TabItem to be created for each element in the list. 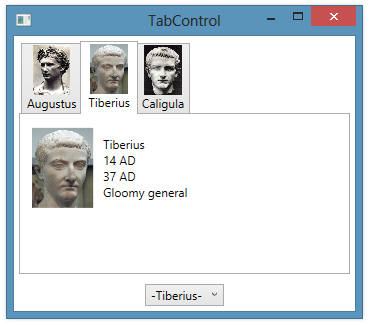 By default, both the header and the content of each TabItem is set to the result of invoking ToString on each item in the collection. You can set the Header of each tab by setting a HeaderTemplate. You set the Content of each TabItem by setting the ContentTemplate property of the TabControl to a DataTemplate containing the desired items. To bind a TabControl to a list of objects, you can set the ItemsSource of the TabControl to an ObservableCollection of the desired object type. This will cause a new TabItem to be created for each element in the collection. By default, both the header and the content of each TabItem is set to the result of invoking ToString on each item in the collection. To set the Header of each tab, dictating what appears on the tab itself, you can set the ItemContainerStyle of the TabControl to a style element, where you set the HeaderTemplate, as shown below. In the next post, we’ll set the content of each TabItem as well. 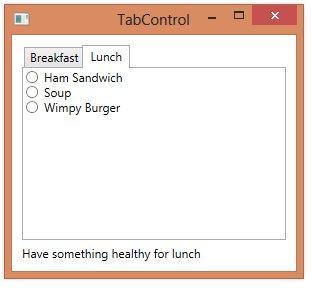 Instead of explicitly defining each tab of a TabControl in XAML, you can bind the TabControl to a list of objects, each tab representing an object in the list. 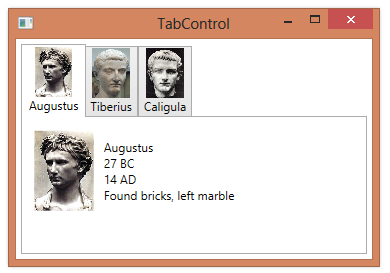 The TabControl now creates a tab for each Emperor object. 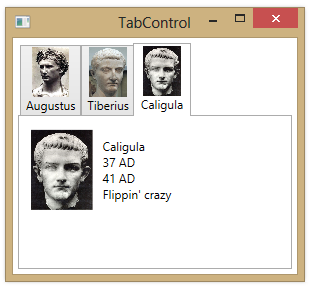 Both the Header and the Content for each TabItem defaults to the object’s string representation–the emperor’s name, in this case). Below is an example of changing the SelectedIndex property when the user clicks on a Button. 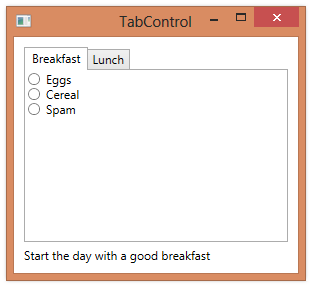 <Button Grid.Row="1" Content="Change Tabs" HorizontalAlignment="Center" Padding="10,5"
You can execute some code whenever a user changes tabs on a TabControl by handling the TabControl’s SelectionChanged event. Below we have a TabControl and we define a handler for its SelectionChanged event. In our event handler, we simply change a text message, based on the tab that’s currently selected.